I'm a massive evernote fan, and use it on my home Mac, an Android phone and my Windows PC at work. One thing I'd love is if tag handling could be improved in EN for Mac. If I want to move tags around in the hierarchy, or rename them, I have to go into the Tags view on the Mac and do it from there. It'd be great if I could drag and drop right from the tree hierarchy in the left-hand side bar just like in EN for Windows. And if I could right-click a tag and rename it from there too. Apart from that minor annoyance, the app is amazing so keep up the good work! PS. Love the new Web clipper too, much more robust than the previous version. I completely agree. The tags are right there in the sidebar. Why would I want to click into another screen, find the tag I'm already looking at in order to interact with it???? Evernote Mac team, please, please, please enhance the tags in the left menu to have the functionality that exists on Evernote Windows. I agree completely. Every right-click context menu item available in the Tags view should also be available in the left Sidebar tag list. In addition, they need to add "Move to Parent" as a menu item. If you have hundreds of tags, drag/drop is a very poor way of doing this. Hey y'all. I moved this to the Mac Product Feedback forum so this can be voted on. I moved this to the Mac Product Feedback forum so this can be voted on. Just in case it is not obvious to someone, to "vote" on this requested feature, go to the top of this thread/page, and click on the up arrow to vote "for", and the down arrow to vote "against". I spend 60% of my time in Windows and about 40% of my time on a mac. Often I have both machines open in front of me. 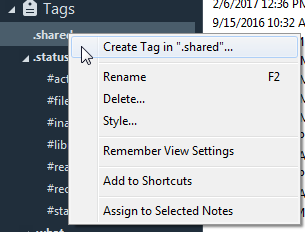 Tag management is easy on Windows with the right click menu and drag/drop. It is painful on the Mac. I've attached a screenshot of the right click menu on both. On Windows, I navigate to the nested tag I want to add to, right click, select "create tag in...", DONE. If I want to rearrange, it is a simple drag/drop. On Mac, I have to go to the tag screen, create a new tag, find the new tag in the list (since it was sorted alphabetically after creating), expand the nested tags to the location I want (which expand to the right instead of down (??? ), and then drag/drop it in. If I want to move one, I need to navigate the crazy right expanding tags, find the source and destination, and drag/drop. Adding tags on the mac is a test of patience, and I will typically go to my Windows machine to make any tag changes. I also use the tag styles in Windows for my top level tags (Bold, colors, etc). That only appears on Windows, I would love it if that appeared on the Mac as well. I cant be the only one with this same frustration and request. Thank you for fixing this! My complaints would be fixed if these same sidebar improvements were added to OSX that were released on EN for Windows back in April 2016.... As long as they update the right click menu!